The author of this article, Charlotte Riggle, is an Orthodox Christian; she is writing to all of us who worship side by side with families with autistic children. And it should go without saying that these exhortations from a mother who has grownup children with autism apply to adults with autism and their families as well, for we are to love one another without exception, even those whose behavior seems strange to us. And we are especially called to render loving assistance to those in need. We all know this. Don’t we? If we truly know it, we’ll do it. There were 2 comments on the October 9th post, Orthodox Christian dvd on autism and worship. This Orthodox Christian autistic man is sharing a very disturbing message with the American Orthodox Christian community. Now while the Orthodox Church is the “fullness of the faith,” the vast majority of us are beginners in the journey to appropriate this fullness, and we often fall into sin. But we are called to repentance from our sins, from unloving behavior such as this man describes. I will tell you a personal story. Many years ago I was involved in what was known as “the Jesus Movement;” unfortunately the group I joined was a dysfunctional one; we were strict and harsh with one another, and pushy and selective in our efforts to win converts; we sought young people. One evening, on the streets of Manhattan, I initiated a conversation with a man walking beside me, seeking to evangelize him. He turned to face me, and I saw that his face was unusually large, and distinctly displeasing to my eye; he was also older. He responded to me, seeking to engage me in conversation, but I responded with a short Christian platitude and ended the conversation. I felt guilty for what I had done to this man; and I still feel shame over my unkind response. I imagine that many people this man had encountered in his life would have done something similar to what I had done. But this man would remember my response in conjunction with empty Christian words. The Good Samaritan, who belonged to a group hated by the Jewish people of Jesus’ day, proved to be a neighbor to the Jewish man who had been robbed and beaten and left lying along the road half dead. He did not allow the prevalent religious animosities between his people and the Jews to dictate his response to the victim he found along the road. Instead, he fulfilled completely the law of love in his provisions to the man, despite their differences. People with autism in the Church will not relate to us in coffee hour in the same was as a fellow neurotypical person will. 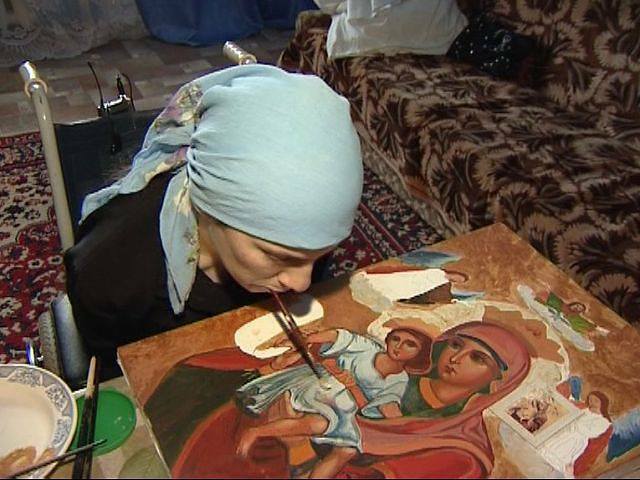 And they may do things during Divine Liturgy that we may not think are appropriate. Nevertheless, they are our brethren; and as we are called to love our brethren, our neighbors, and even our enemies, we are certainly called to make every effort to try to understand the situation of our autistic brethren and visitors, and be there for them to the best of our abilities, to resist the temptation to criticize and condemn the differences they manifest, that they may feel welcomed and loved. There is a prevalent misconception in the general culture that autism is childhood condition, something one can grow out of; we are more tolerant of autistic children than of autistic adults. Many of the government support programs for them end when they become adults. According to a September 5, 2015 New York Times article (which can be accessed below) 90% of autistic adults are unemployed or underemployed. This factual article is also a personal story; the life of an autistic man, Joshua is inter-weaved with the facts presented. While reading the article, reflect on how you might respond to an autistic adult in your Parish, in light of Joshua, the 53 year old Orthodox Christian man, and the facts of American adult autistic life. A discussion with Maura Oprisko, a writer, in regard to raising a child with autism in the Orthodox Church. She speaks of her entrance into the Orthodox Church, the first years with her child with autism, the initiatives she took when it became clear to her that her son William is autistic, and also about her writings and future writing projects. A webpage on which one can find Parts, 3, 4, and 5: The Sounding And there may be more. We pray to The Venerable Gerasimus to intercede before the Lord to strengthen and heal our brothers and sisters in Christ, who live with mental illness. Let us praise divine Gerasimos the protector and champion of Orthodoxy, / An angel in the flesh and a God-inspired wonder-worker. / He received from God the gift of healing / And grants cures to those who honor him! A recent Ancient Faith Ministry podcast, with Dr. Albert Rossi, interviewing Alexis, the person with this illness. My wife and I attended one of his retreats, and I would have to say that it was one of the best retreats in which we participated. Alexis shares about facing her inner contradictions; she also speaks of how knowing God has given her strength to deal with the rejection she faces because of her illness. One more thing. God is in the illness. He is in the nethermost Hades. He waits to be gracious. This webinar will discuss the role of the church in meeting the needs of parents and caregivers with children that have special needs. This will be the first of many conversations addressing the many issues families/caregivers of children with special needs face as they seek to engage in their Orthodox Christian Community. This panel will include Fr. James Kordaris, Presvytera Melanie DiStefano, and Angie Giallourakis with Melissa Tsongranis moderating.